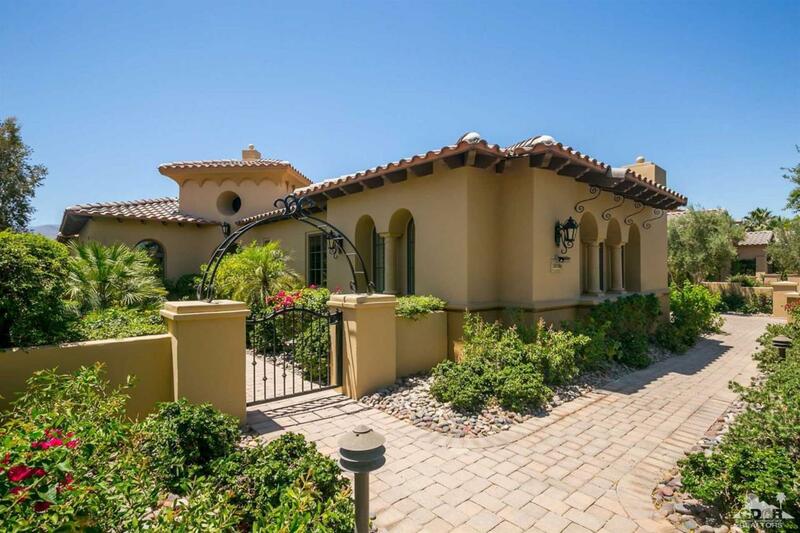 Behind the gates of the exclusive Andalusia Country Club sits the home that defines Golf Course Living. South Facing on the 3rd fairway of the Rees Jones designed course, this plan 4 Duquesa possesses breathtaking views that greet everyone who enters with expansive floor-to-ceiling windows framing a picture perfect backyard with Santa Rosa & Coral Mountain backdrop. Thoughtfully designed and meticulously crafted, the quality and style is undeniable w/exquisite finishes throughout. The gourmet kitchen provides every amenity including high-end appliances & central island for gatherings and easy entertaining. The master suite is adorned w/fireplace, his & her closets, jetted tub, and dual entry radius-top doors that lead to the unrivaled backyard. Overnight guests are embraced in the same richness found throughout the home w/fireplace, kitchen-area, private bedroom & bath. The backyard extends the excellence of the home with pool/spa, BBQ, firepit and 2 fire bowls along the pool ledge.